Pierre-François DE NOTER: Painter of landscapes, city views and interiors; etcher, watercolourist and engraver. Pierre François De Noter was the uncle of David De Noter and the brother of Jean-Baptiste De Noter. He studied sculpture under van Geel at the Mechlin Academy until 1793, but from 1807 on he devoted his life to painting. He toured Holland, Switzerland and France. A prizewinner in Ghent in 1820, he was appointed teacher at the Ghent Academy two years later. 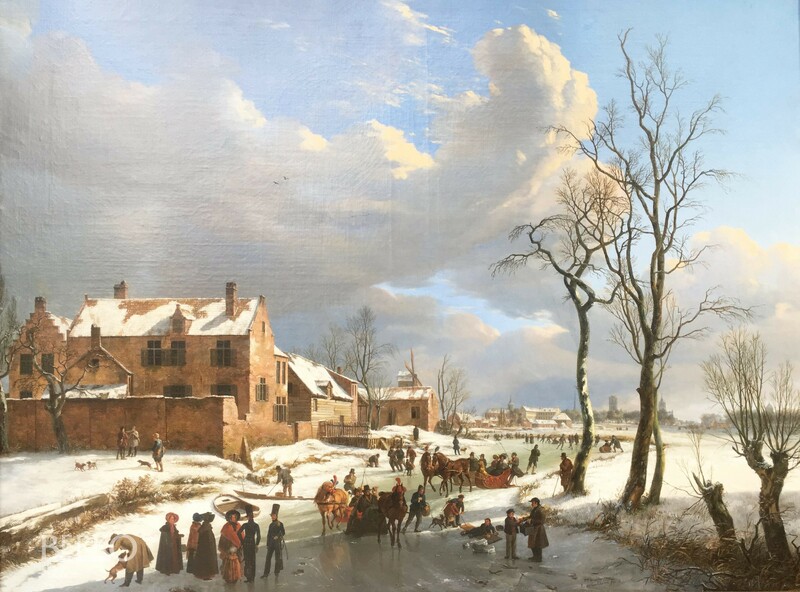 De Noter succeeded in giving a pleasant and picturesque aspect to his city views and landscapes. The qualities that distinguish his works are aptness of drawing, accuracy of detail and particularly a genuineness and harmony of colour. He often collaborated with Eugène Verboeckhoven, who added figures and animals to his paintings. Painter of animals, animated landscapes and portraits; sculptor, engraver and lithographer. Eugène Verboeckhoven studied under his father, Barthélemy Verboeckhoven, a sculptor. In 1816 he worked under Albert Joseph Voituron in Ghent, where he exhibited from 1820 onwards. He visited the Ardennes, France, Great Britain, Germany and Italy. He played an important role in the Belgian Revolution of 1830 and was appointed Director General of the Brussels Museums. He was held in high repute. He elaborated on the works of artists such as Jean-Baptiste De Jonghe, Pierre François De Noter, Barend Cornelis Koekkoek, Edouard Delvaux, Alexander Joseph Daiwaille, Frans Keelhoff, François Verheyden and his pupils Louis-Pierre Verwée and the brothers Charles and Edmond Tschaggeny. Pierre-François DE NOTER: P. & V. Berko, "Dictionary of Belgian painters born between 1750 & 1875", Knokke 1981, p. 212. P. & V. Berko, "19th Century European Virtuoso Painters", Knokke 2011, p. 499. P. & V. Berko, "Eugène Verboeckhoven", Knokke 1981.